Design thinking is a mindset to negotiate uncertainty and cultivate innovation. This introductory seminar will address fundamental processes of design thinking from empathize, define, ideate, prototype, to validate, and explain the differences in terminologies and methodologies from service design, agile prototyping, and lean startup. 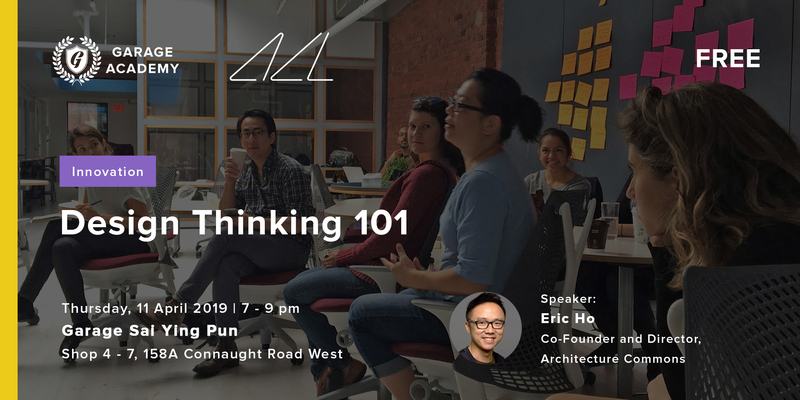 Consider this a crash course in design thinking as it applies to your corporate work, your own startup project, or your social enterprise, and a great opportunity to network with participants that are interested in Design and Business. We will also go over application of design thinking in startup, corporate innovation, social innovation, and urban innovation. No prior experience or knowledge is required and all with an open mind is welcomed to introduce this mindset to your work or your organization. Architect, entrepreneur, and urban thinker passionate about architecture and urban environments that have a lasting impact on society, Eric Ho is the co-founder and Director of Architecture Commons, a design agency for urban innovation. Eric studied architecture at University of Pennsylvania and Harvard University Graduate School of Design, where he was the recipient of the Faculty Design Award. In addition to his passion in architecture, Eric has started a civic start-up MILES: a real estate platform for neighborhood and community good through activating underused storefront spaces, and Good Goods: a next generation shared economy platform for retail. Eric is currently also a faculty member at Parsons School of Design teaching design thinking and design strategy in their Global Executive Masters Program in Strategic Design and Management based in New York, Shanghai and Paris.